Like any good joke, it has an element of truth. Ireland has only three synagogues and about 2,500 Jewish residents out of a total population of 4.7 million. Savannah has more Jews, about 3,000. Even at their 1940’s height, Irish Jews only numbered about 5,500. And yet, Irish Jews produced an Israeli prime minister, Chaim Hertzog; an influential cabinet minister of recent times, Alan Shatter; an international rugby player, Bethal Solomons; the novelist and playwright Stanley Price and scores of other notables. They are not a joke. They exist and thrive on an Emerald Isle that’s richer than you think. 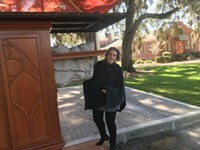 Keeley hopes to get that message out there into our consciousness with a new exhibit that’s on display at Savannah’s Congregation Mickve Israel, the third-oldest Jewish congregation in America with a “punching above its weight” story of its own. The exhibit explores Irish-Jewish connections in literature and history. The displays traveled to seven different Irish cities and to New York City, Washington D.C. and the San Francisco Bay area before spending “the most Irish month of all” right here with us. Consider the Oscar-winning film director, Lenny Abrahamson; the Irish women’s rights activist June Levine; or Abraham Weeks, the first person killed in the 1916 Easter Rising, the first armed action of the Irish revolutionary period. And so now we have to talk about fictional characters like Leopold Bloom, the outsider in James Joyce’s “Ulysses;” Shylock, the Shakespearean moneylender in “Merchant of Venice;” or Melmoth, the titular, demonic “Wandering Jew” of Charles Maturin’s book. All of these anti-Semitic characters greatly influenced the English speaking world. The exhibit doesn’t shy away from this history or the more complex appropriation of Jewish struggle in the struggle narratives of Irish nationalist movements. 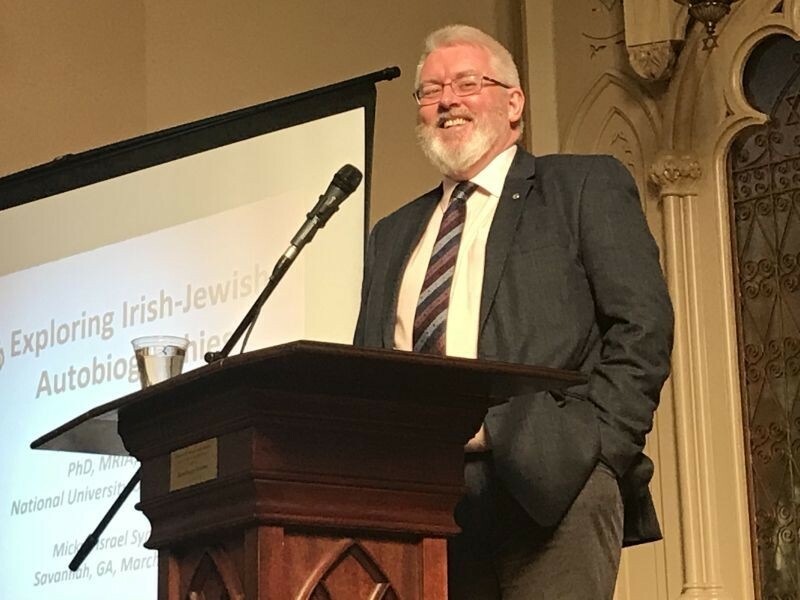 “We’re investigating what the representation of Jews in Irish literature says not only about Jews in Ireland but also what it says about Irish identity,” Ó Dochartaigh says. Of particular interest to you and me are the exhibit’s Irish-Jewish-Savannah connections. Our city’s first St. Patrick’s Day parade in 1824 welcomed the Irish-born Catholic Bishop of Charleston, who delivered an address in which he compared the Irish in their native land to the Israelites in their captivity. Let my people go. An eternal rallying cry. Georgia Southern students interacting with a group of historical re-enactors focused on Ireland’s 1798 Rebellion and the follow-up 1803 rebellion organized by Robert Emmet, after whom Savannah's Emmet Park is named. 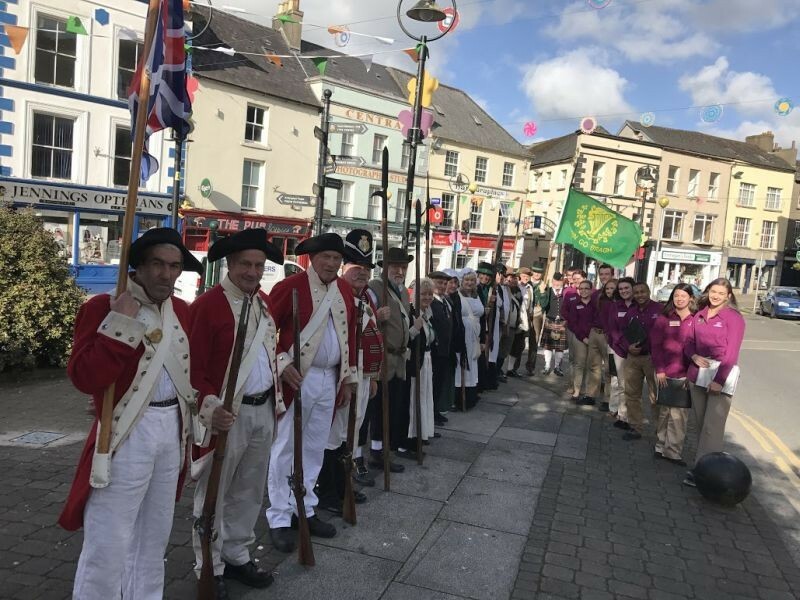 The students are in the town of Enniscorthy in central County Wexford, Ireland. When Savannah’s Hibernian Society was formed in 1812, among its first members was Isaac Minis, grandson of Abraham Minis, one of Savannah’s original Jewish settlers in 1733. The Hibernian society lives on today, as does the Minis family. And then there’s George Solomons, an Irish orphan who came to Savannah by way of Mississippi and ended up serving Mickve Israel as its rabbi for the first four decades of the 20th Century. A Jewish reformer, he also chaired the Georgia Interracial Committee. You might call his great-great nephew, Mires “Bubba” Rosenthal, Jr., the congregation’s current president, an official supplier of St. Patrick’s Day, since, as owner of Habersham Beverage, he might sell you some fine Irish whiskey or beer. The world unites in drink. “We are pushing the message of Ireland’s diversity,” says Stephens, whose government is sponsoring the exhibit. Y’all pay attention now. Ireland’s prime minister is Leo Varadkar. He’s the son of Indian immigrants. And he’s openly gay, only the fourth openly LGBT head of government in the entire world. So let’s change what we think of old Eire. And maybe old Irish Savannah and the whole world while we’re at it. We humans are a lot more than our jokes make us out to be. Daniel O'Connell: The Emancipist, Hero to the Jews and in Savannah, Thurs. March 15, 7 p.m.
Children of Erin and Abraham: Irish-Jewish Connections in Savannah, Sat. March 24, 12:30 p.m.
Pop-Up Ceili: An Irish-Jewish Celebration, Exhibit Closing Event, Wed., March 28, 7 p.m.